"AS A CONCERT IT'S VERY GOOD THEATRE"
"the energy level is at fever pitch"
Thriller Live is spectacular, high-energy tribute to Michael Jackson and his extraordinary music, which opened at the Lyric Theatre in 2009 and continues to thrill pop music fans and theatregoers alike. 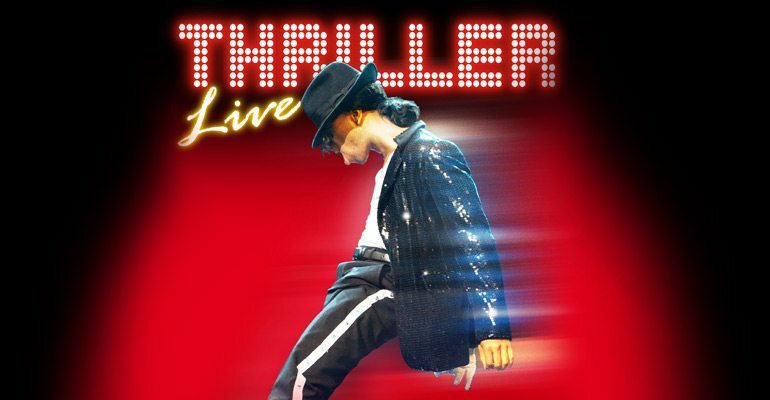 An incredible show that brings the smash-hits by the King of Pop back to life, Thriller Live is the ultimate concert experience, complete with a talented cast and band. Complete with breath-taking multimedia effects and stunning choreography recognisable from Jackson’s iconic music videos and gigs, this is a show perfect for the most ardent of Michael Jackson fans. Spanning the impressive 45-year career of Jackson, Thriller Live boasts a set list including "I Want You Back", "I'll Be There", "Beat It", "Billie Jean" and of course, "Thriller”, plus many more. Seen by over 4 million people from 30 countries, the show is a phenomenal homage to Jackson’s legacy. Moonwalk your way into the Lyric Theatre for a night that you will never forget. Thriller Live is recommended for those aged 5 and up, and contains constant use of flashing LED screens and strobe lighting. Under 4's will not be admitted into the theatre. I went to see Thriller with my husband and it was fantastic! It's not exactly the most highbrow of shows but it certainly did the trick, we both love Michael Jackson's music and it really delivered. There isn't much of a plot line but that's not what we paid for. The singers are excellent and so are the dancers. Overall a night of feel good fun! Thriller! Thriller Live! Ahh I can't stop singing all the amazing Michael Jackson songs after seeing this zesty West End show! I found I really fun but there isn't really a story. This didn't bother me as I just went to hear MJ music, but I heard some audience members grumbling. Personally I felt they should just get up and boogie. I saw Thriller Live last year. I am not a really big fan of Michael Jackson, but I like some of his popular hits and therefore thought I's enjoy the show. I was wrong. It was hideous. It was like watching a really cringey talent contest with an MC with a faux american accent. Also, MJ was such a talented triple threat performer, no one onstage can live up to him. By this I mean it was rare to see a performer who could both sing and dance with prowess, let alone command anywhere near the same stage presence! Also there was way too much fake whooping and cheering! ARGH!